A good Axe is an essential part of your survival kit, and is necessary for chopping firewood, felling trees and building camp. We stock a range of shapes and sizes, from top brands such as Gerber and Hultafors. 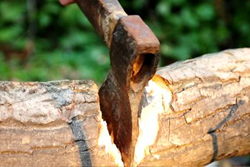 Smaller axes are good for precision tasks such as chopping kindling and shaping wood, where larger axes are ideal for felling trees and clearing pathways where necessary. We even stock throwing axes for those looking to further hone their tactical hunting skills, although we advise caution when hunting with throwing axes as it takes great skill to get it right!